When I was growing up, we had Sunday Dinner at my grandma’s every single week. It wasn’t something that was put on the schedule. It didn’t require a phone call. It just was. Every Sunday, my grandma would cook a spread of pasta, meats, potatoes, vegetables, salad, and more. Our family (both immediate and extended) would show up around lunchtime, usually moseying in after church, and sit down to eat. We wouldn’t just eat dinner (which is what Italian families call lunch), we would spend the entire day there. Sometimes we’d play cards or games, or watch football, or complain that my uncle was watching golf… and sometimes we’d just sit around the table and BS. My great aunt (my grandma’s sister) lived on the other side of the duplex that my grandparents lived in, and she often made a broccoli casserole on Sundays. I never had the recipe, but I know it was made with some cream of mushroom soup, I think frozen broccoli, and a Ritz cracker topping. 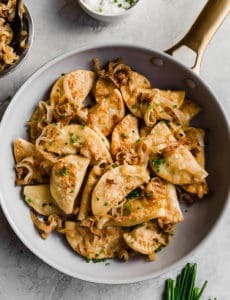 It definitely fell into the category of comfort food, much like the scalloped potatoes that often graced the table that my cousin and I would hoard, right on through adulthood. We always devoured the broccoli casserole, and recently I was thinking about it, and wanted to recreate it, but with homemade, from-scratch adjustments. 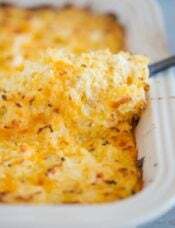 I’ve long thought that this casserole would be a fabulous addition to a Thanksgiving spread, and finally sat down this year to put some thought into recreating a homemade version. 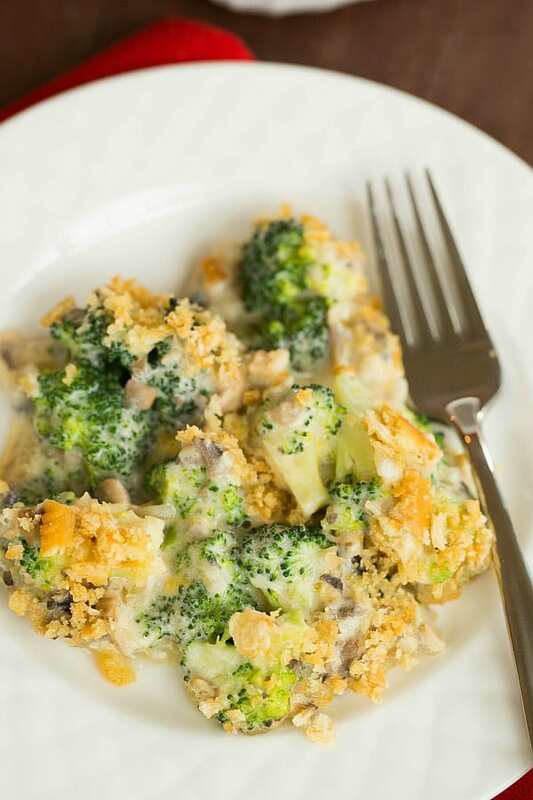 This revamped version uses fresh broccoli, chopped mushrooms, an easy homemade white sauce, some cheddar cheese, and because I cannot quit Ritz crackers, I kept that same buttery cracker topping. The result was amazing, and brought back so many fun Sunday afternoon memories. Sunday dinner is something I really miss and totally took for granted when I was younger; making dishes like this makes me feel closer to my grandma, who I miss tremendously. I’m so thankful that she fostered an environment that enabled us to make so many wonderful memories growing up. 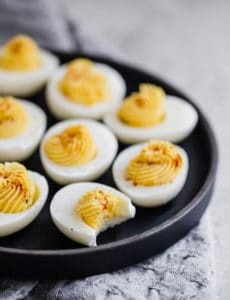 This is a wonderful recipe, just the right amount of cheesiness and creaminess. The cracker popping gives it nice texture too. Will definitely make again. Can this be made a day ahead and popped in the oven the day of? Hi Marilyn, Yes, that would work! I made this today. This recipe is special. So good. Thank you for sharing it with us. I am thinking of taking this to a potluck lunch. Is it good at room temperature? Hi Donna, It’s not bad, but if you have a thermal carrier or something similar you can pack it in to retain as much warmth as possible, that would be best! It doesn’t have to be piping hot, but the consistency will change once it cools to room temperature. 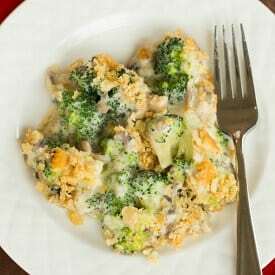 This is my go-to recipe for broccoli casserole. I omit the shrooms. I love this recipe. 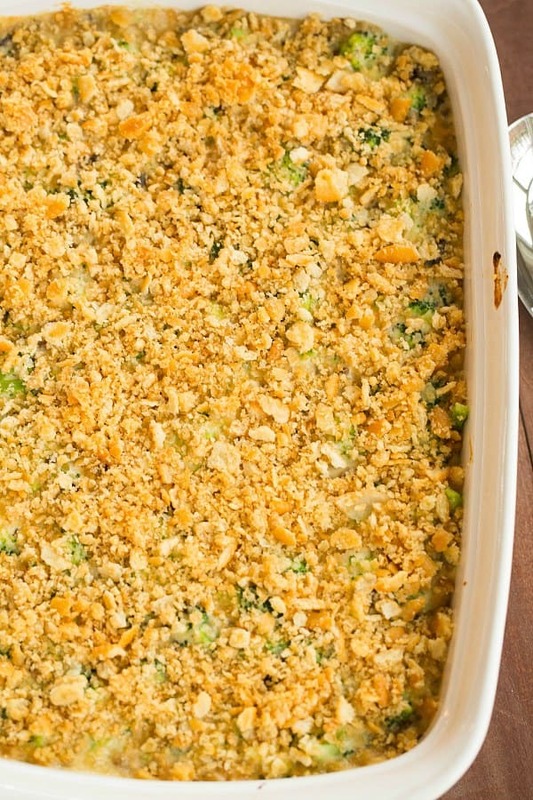 I am making your broccoli casserole to take to a Christmas dinner . How many cups of florets is equivalent to your three pounds? I am using frozen so should I just thaw them out? I prefer fresh but a sprained wrist is making it tricky to use a knife. Hi Joyce, It’s about 8 cups. I think thawed frozen should work okay. I hope your wrist feels better! Massive fail. Taste was just OK but the sauce really thinned out and wasn’t attractive. I’m a pretty good cook so wasn’t expecting this. I wouldn’t make it again. I made this last night and was disappointed. My cheese sauce didn’t seep into the broccoli layer below and just kind of sat, layered, on top. Then a layer of water was underneath the broccoli (even though it was par-cooked per the recipe). Next time I try this, I will mix the cooked broccoli with the cheese sauce before putting into the pan. Hopefully that will eliminate the separated layers. I’m curious if you used pre-shredded cheese or did you grate it yourself? 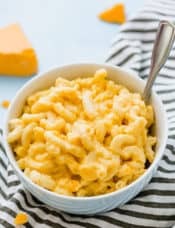 Pre-shredded cheese has an anti-caking agent that can inhibit melting. Hi I’m wondering I you could add in some cooked chicken and rice?. Or do you think it would throw the flavors off? Hi Mary, I think it would be okay, just be aware that the rice may absorb some of the sauce. 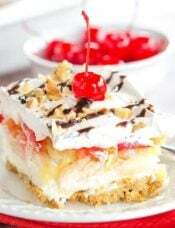 Am planning to make this for Christmas dinner and am wondering if it would fit in a 2-quart baking dish versus a 9 x 13. What do you think? Thanks! Hi Amanda, There is too much filling to fit into a 2-quart casserole dish. Made it in a 9×13, and it was a huge hit! 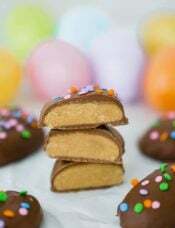 Definite family favorite and will be making again. Thanks so much! Thank you for sharing! I look forward to trying more recipes from your site! This looks delicious! I’m on a bit of a Greek yogurt kick lately, how do you think it would be if I subbed some of the milk for Greek yogurt? 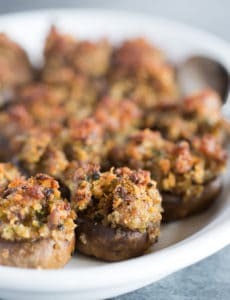 I’m thinking even if I add it with the mushrooms and onions, it may curdle too much in the oven… any thoughts? Hi Ryan, Unfortunately, you can’t. The milk is used to make the sauce; it thickens along with the flour. Subbing yogurt here would not have the same effect. Can you substitute skim milk in this recipe? or perhaps a mix of skim and fat free half and half? this recipe looks fantastic, just needs to be “healthified” for my relatives. Thank you! Hi Megan, The sauce will not thicken up very much with skim milk. I would recommend using 2% milk if you want to do something other than whole milk and still want the sauce to come out correctly. Can we substitute some of the butter with olive oil? Hi Deb, Sure, I don’t see why not. Hi Maritza, I used them to mimic the cream of mushroom soup my aunt used to use; you can simply omit them. 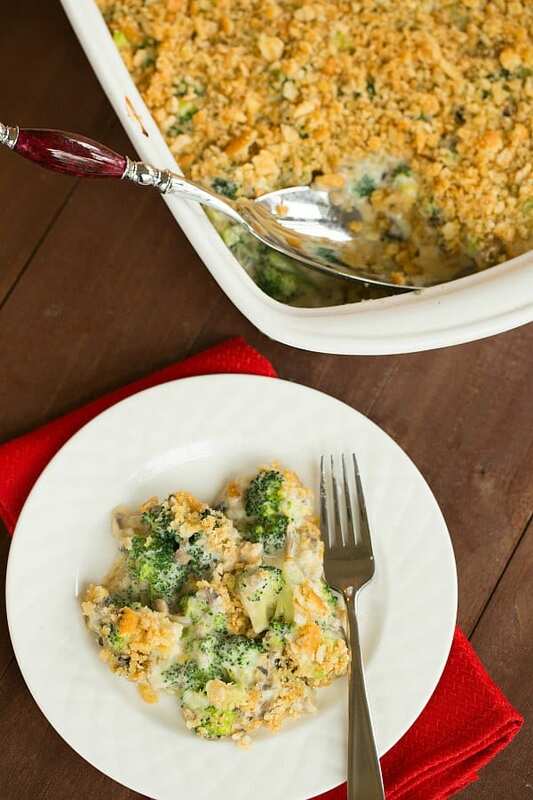 hi there – I make a similar broccoli casserole but wanted to know if you could freeze it? I need to make it a week in advance. Hi Victoria, I’m not sure how it would freeze, with the cream in the recipe. I would probably try to make it the day before and refrigerate it. 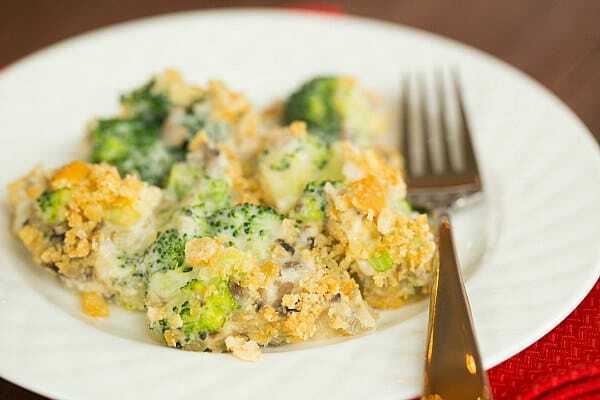 What a tasty broccoli casserole! <3 your site! Also awesome that you actually write your recipe in true recipe form. I get confused when bloggers put it under the picture. Thanks for sharing. I’m making this for our Thanksgiving meal get together! It just sounds right and so I’m sure it will be (as long as follow directions well, lol)! Thanks for the story about your family. What a wonderful memory you have! 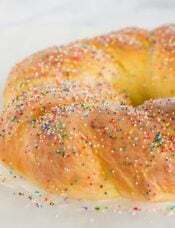 Can this be made the day ahead minus adding the Ritz before baking? Then day of just add the Ritz & bake? Thoughts? Hi Kelly, Yes, I think that would be just fine. Enjoy!